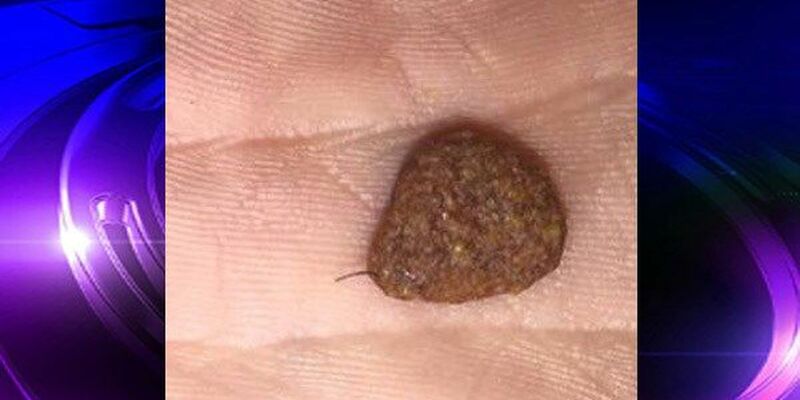 RICHMOND, VA (WWBT) - Pictures from worried pet owners have been circulating the Internet over the past few days, claiming to show wire-like objects lodged in their Pedigree brand dog food! "I decided to check the bag I have, since my dog has been eating more grass and having stomach issues," said Samantha Barrett in a Send It To 12 photo, "and sure enough almost every piece of food had these black (and some lighter color) hairs coming out of them. Some people think it is wire some think it is pig/cow hair but it is pretty sharp." Another viewer sent a photo clearly showing a thin, black fiber sticking out of a piece of dog food, saying the objects were found in "every single piece." Pedigree's social media accounts have been inundated with people claiming to find these objects, and wanting an explanation. The company has been replying to individuals on social media, saying the objects are normal, and harmless. In one reply on their Facebook page, Pedigree stated, "Safety is our first priority, which is why we conduct hundreds of quality checks each day in our plants. There are absolutely no quality or safety concerns with natural fibers from meat and bone meal, like pig hairs, and they are completely safe for dogs to consume. If you'd like to learn more, feel free to call us at 1-800-525-5273 (8:00am-4:30pm CT)." Last year, Pedigree issued a recall due to metal fragments found in certain bags of dog food. However, this appears to be something different; in the 2014 recall, the metal fragments were loose and not embedded in the food, unlike the fibers that are being documented now. Product quality and safety for our pets is our first priority and we can assure you that our PEDIGREE products are safe and nutritious to feed your pet. We conduct hundreds of quality checks each day in our plants, including metal detection. We've heard from some consumers that they've seen some pieces of kibble with what they think is a wire sticking out, but we've confirmed it's actually natural fibers. Because PEDIGREE is manufactured using meat and bone meal, it's possible for natural fibers, like pig hair, to appear in the finished kibble. There is absolutely no quality or safety concern with the natural fibers. They are completely safe for dogs to consume. We take every product complaint very seriously, and encourage consumers with questions to contact us at 1-800-525-5273. We'll let you know if Pedigree puts out any further statements, or if any dog food does get recalled.